AUGUSTA, Maine — Senate Democrats have elected Sens. Troy Jackson of Allagash and Anne Haskell of Portland as their new leaders in the wake of Sen. Seth Goodall’s resignation on Tuesday. Jackson and Haskell were elected majority leader and assistant majority leader, respectively, in unanimous votes recently in Augusta. Jackson, who is a logger, is in his third term in the Senate and since January has served as the Senate’s assistant majority leader. He has been one of the Senate’s more outspoken advocates for Democratic causes, and by extension one of the more strident critics of Republicans and Gov. Paul LePage. 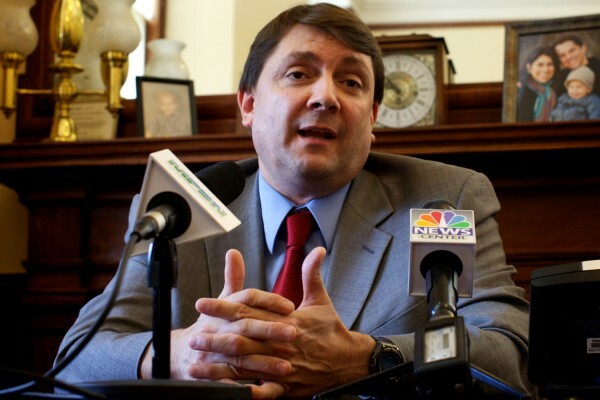 His profile raised considerably last month when he became the subject of personal attacks by LePage after criticizing the governor for being an obstructionist. LePage told reporters Jackson has a “black heart,” that he should go back to the woods to cut trees and “let someone with a brain come down here and do some good work,” and that he “claims to be for the people but he’s the first one to give it to the people without providing Vaseline.” LePage later apologized for the comments, but not to Jackson. Days later, Jackson announced that he is exploring a run for Congress in 2014 if 2nd District U.S. Rep. Mike Michaud pursues the Democratic Party ’s nomination for the governorship. Haskell is one of the Legislature’s most tenured members, having served six terms in the House — including chairing the Criminal Justice Committee — before her election to the Senate last year. She is currently Senate chairwoman of the Taxation Committee and serves on the Inland Fisheries and Wildlife Committee. As a legislative leader she will leave those committees and have to be replaced, likely after a special election to fill Goodall’s District 19 seat. Senate Minority Leader Michael Thibodeau, R-Winterport, said Wednesday that although he sees Jackson as one of the Democrats’ loudest partisan voices, Haskell is known for being approachable and willing to negotiate. Goodall’s resignation Tuesday came after the Richmond resident was appointed by President Barack Obama last month to become the Small Business Administration’s New England director. LePage has yet to set a date for the Senate District 19 special election, which has already attracted three Democratic candidates and one Republican. County Democratic and Republican party committees will choose the nominees. Senate District 19 includes all of Sagadahoc County and the town of Dresden in Lincoln County. Goodall was in the midst of his third term representing the district.